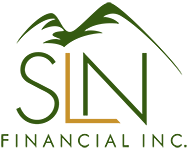 5 Tax Changes You Need to Know for 2018 | SLN Financial, Inc.
It’s that time of year—Uncle Sam is asking for money again. If you’ve kept up with the news, you probably know the tax laws have changed a bit. Here’s five important changes you should know before Tax Day. 1. Standard deductions increase. If you’re married and filing jointly, your standard deduction is now $24,000 – up from $13,000 under the previous law. If you’re single, or married and filing separately, you’ll have a $12,000 standard deduction, up from $6,500; and heads of households’ deduction will be $18,000, up from $9,550. 2. Personal exemptions are no more. In the new tax reform bill, personal exemption is being done away with. 3. Estate tax exemption doubles. The estate exemption has doubled since the previous law to $11.2 million per individual, and $22.4 million per couple. 4. State and local tax rules re-done. For both income and property taxes, the itemized deduction for these is limited to $10,000. 5. Rises in contribution limits for retirement savings. Certain plans, such as 403(b), 401(k), and many 457 plans – along with the Thrift Savings Plan – see a $500 increase in contributions limits, from $18,000 the previous year to $18,500. What other changes are there? Give us a call and we can assist you in understanding all your tax needs for 2018.